China (mainland) Shanghai Shanghai,Shanghai Fengcheng Industrial Park. 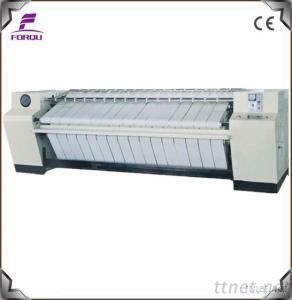 1, Ironing machine for bedsheets, quilts, tablecloth, towel, curtain, bath towel etc. 2, Large diameter roller drum, stainless steel, surface is smooth. 3, Frame and auxiliary, high-quality steel carbon structures, strong and durable. 4, Variable frequency, variable speed, according to fabric, moisture, steam supply, etc. 5, Simple control with Start/Stop button. 6. Sealed rotary joints, prevent leakage, safety and reliability, save energy. 7. Three-phase electrical system, overload protection, voltage and short circuit protection, emergency stop switch. 8, The fence and travel switch in the input part, reduce fatigue, misuse and the risk. 9, Pressure roll with guiding ribbons, superior ironing quality, nomex ironing belts. 10, Heated: steam, electric, gas, PLG. 11, Roller quantity, one, two, three, four, you can choose.